Everyone has a creative slump sometimes, that's just part of life. Being part of a design team doesn't change that fact, and little miss pants here has been in quite the slump lately. I don't even want to enter into contests to win scrappy stuff right now because...I just don't care. This is completely normal. Sometimes you can walk away and come back when you are ready. The last time I did that I didn't step foot in my room for 5 months. Obviously this tactic is not going to work when you have scrappy commitments and obligations. (birthday cards for family members, DT obligations, Christmas gifts planned, etc.) You have to be gentle with your mojo and coax it back into existence. Is there a particular music that seems to get your mojo flowing? Queue that up and just enjoy being surrounded by your space and your tunes. 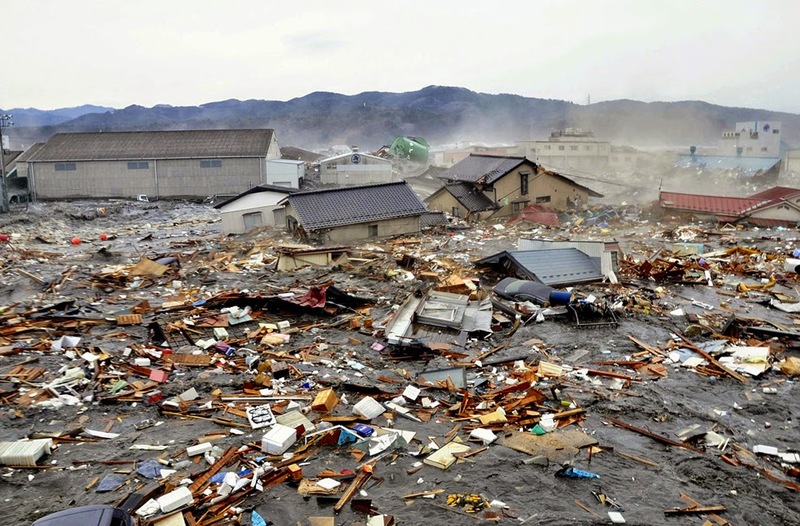 Is your space a mess and just overwhelming? Clean it up one spot at a time. Do this slowly and walk away frequently. Maybe pick up your space over the course of a week doing just a little each day. The important thing is to make sure you don't overwhelm yourself because that will just make your mojo run away even more. Put together page kits. Either with photos or without. Once you have a manageable kit in front of you, you may find yourself inspired. Peruse Pinterest for ideas. 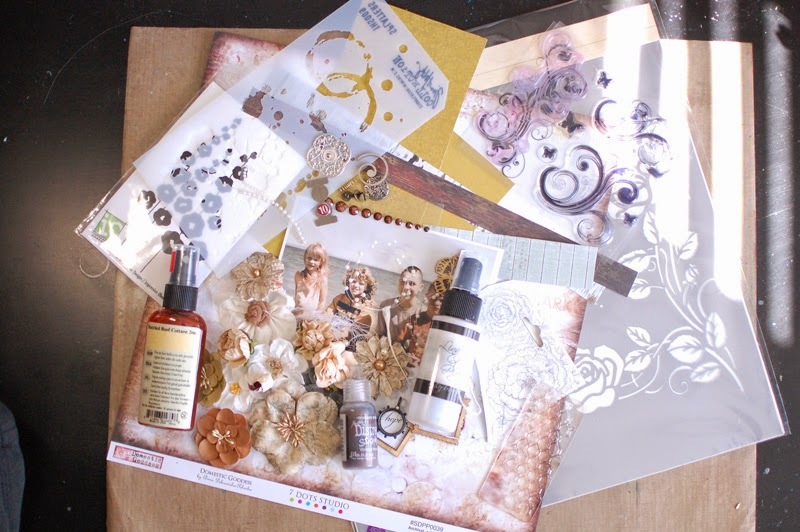 Don't just search "scrapbooking" but go beyond. Look into color palettes or beautiful photos that inspire you. Do you like the color of a particular door in an artistic photo? Or a beautiful mandala? Did someone pin some refinished furniture that you just love the distressed look of? Could you maybe try to recreate that finish on some chippy pieces or wood pieces? Keep an art journal and just make a mess. 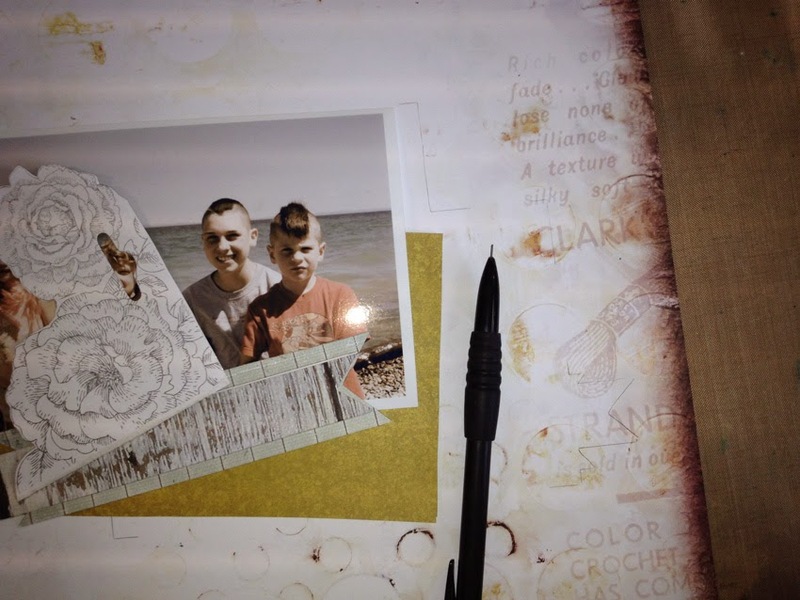 Grab your art journal and just start throwing paint and stamps and what-not at a page without thinking. Watch an inspirational movie. I love the imagery in Memoirs of a Geisha...just visually stunning as a movie. I adore the art studio and house in The Time Traveler's wife. These are things I pull from, movies that just speak to me. For the last month my mojo has been on a serious hiatus. I just have no interest in anything scrappy related. I sat at my desk petting all my semi-recently purchased pretties for an hour...and got nothing. Granted, I didn't have time to clean my room and that was probably not helping but still...what was I going to inspire all my eP gals with?! I started by perusing Pinterest (which I've already done numerous times) and found myself focusing on color palettes. I decided I wanted to do something with yellow (but I kept clicking on green stuff...don't ask just go with it). Deciding on yellow I then turned to my pictures in iphoto. There was already a group of photos up from a 2011 vacation so I decided not to overcomplicate things and just pick one. I waited for one to speak to me and then dropped it into Elements and antiqued it to make it more neutral (easier to work with considering the lacking mojo). While my photo printing I turned my attention to my desk. I now had a manageable coordinating pile of stuff to work with. Still no mojo...but I didn't have to "wait" on inspiration now to give me direction. The best thing to do at this point is just not think. 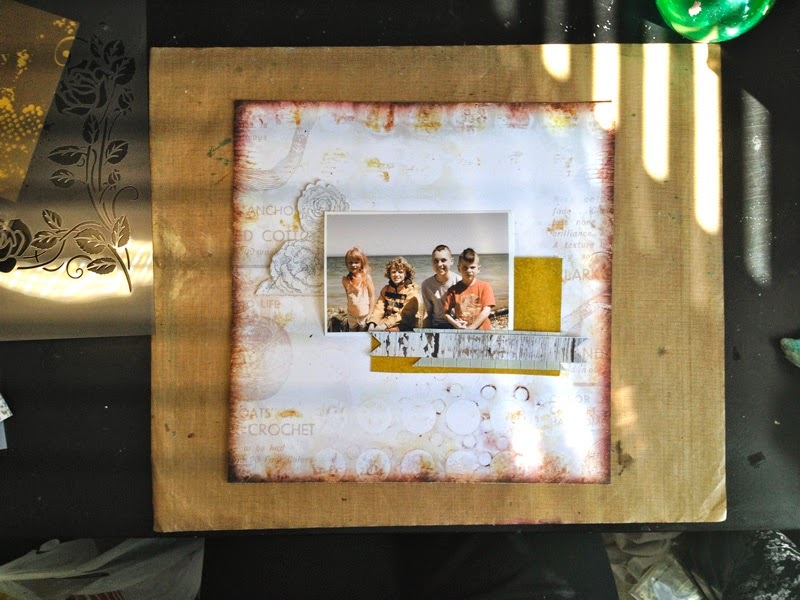 I know I wanted the smaller papers and border strips layered under the photo and I wanted to use a lot of my mists and masks so I know those have to be first. Therefore I laid down my photo and the pieces of paper in a generic order. Considering the lack of mojo...it didn't have to be fancy. At every step I just "went with it". I decided with those little scraps of border I wanted to cut ribbon ends. 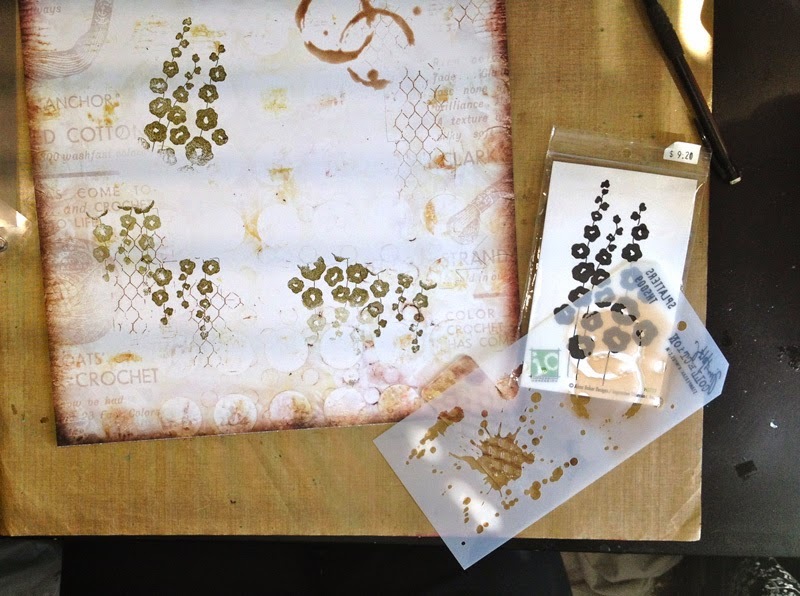 Next I added my Wendy Vecchi embossing paste in black through my new Prima stencil for the splatters and the title. I added some Prima wood pieces from the Stationer's Desk collection and flowers from the Petaloo Color me Crazy collection. Some of the Prima flowers are from the new Something Blue collection as well. I finished off the final page with some random dots in Vintage Photo Distress Stickles. And here is my final page...Completely mojo-less. I actually don't think it's too bad. So when your mojo takes a hike take heart, you can still create, it will return. Try some tactics but most of all...just let go. Wow- love this! I think you're just not recognizing your mojo - because it must be there (!) at least subliminally (??!) 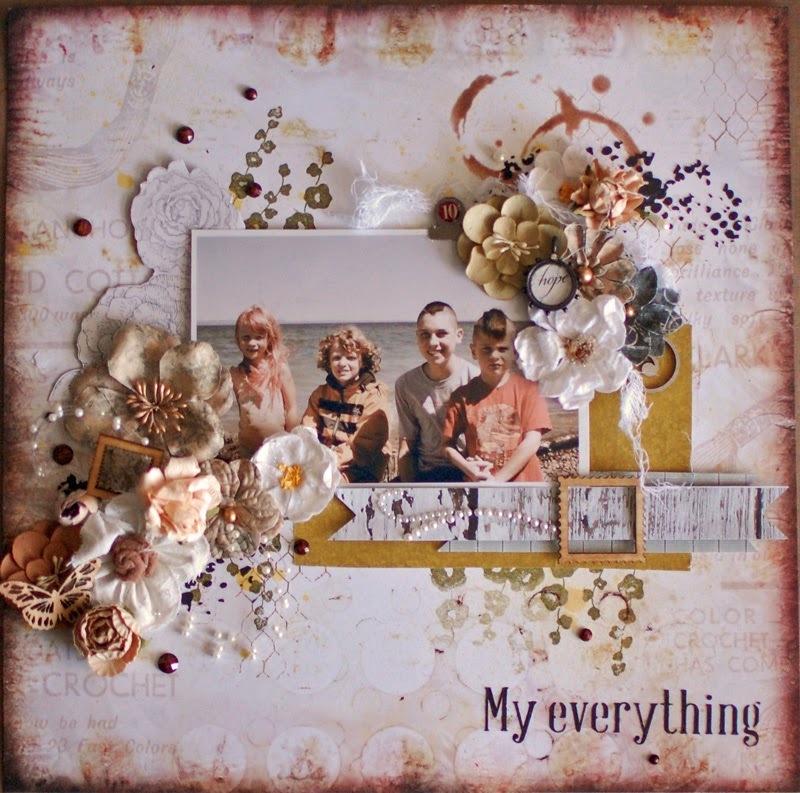 fabulous clusters of blooms and stencilings - and wonderful soft colors to highlight your lovely vacation photo! Thanks for all the tips for creating when it seems there is no spark!! I guess it works! Andiepants, even when your mojo is gone, the end result is just SPECTACULAR! 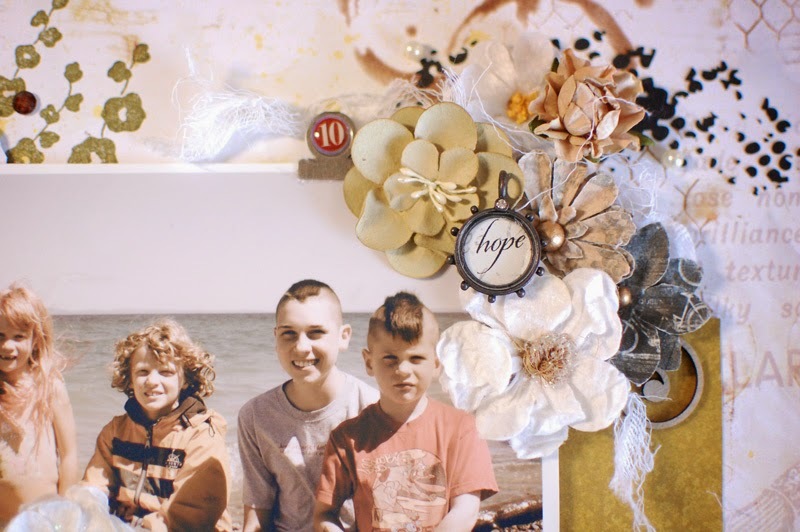 Love the sentiment and all of your layers, textures, and your process! Thx for sharing! Wonderful how you walked us through your process and I love all those tips. But my stuff never turns out as awesome as your page did. It's gorgeous. This is gorgeous! I love the colors, arrangement and beautiful embellies. :) Awesome tips too, thanks. Ohhhhhhh beautiful Andie and I think your mojo is alive and well...stunning layout!